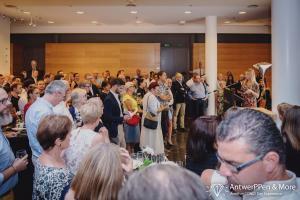 After months of hard work and preparations, the AntwerPPen & More vernissage took place on Friday July 21st. Over 200 people came by to admire our collection, listen to our stories and discover our latest special editions. At Conid, we like to do things differently. Therefore we decided to take a different approach to the traditional exhibition. We wanted to highlight our connection to Antwerp, our passion for our hometown and how it inspires us every day. Antwerp’s dynamicity and innovation are what inspires us, but also many other Antwerpian citizens and entrepreneurs. This idea eventually resulted in an interactive, inspiring and exceptionally different exposition. The Conid team, the true driving force behind everything we do was fully present to chat, meet and talk to the visitors about their common passion: handwriting, Antwerp and technology. We also invited three fellow Antwerpians to inspire us with their unique stories, connections and perspectives. Jan van den Nieuwenhuijzen is the former CEO of SD Worx and is now engaged in many Antwerpian social and youth projects. He talks about how the people of Antwerp and Conid share many values, which we should pass on to our future Antwerpian generations. Read his full story. Patrick Andersen is the head of Delaware Belgium and has a great passion for Antwerp and fountain pens. As befits a true Antwerpian, he likes to do things his own way. That is why he uses his fountain pens to personally write a note to all of his employees. Read his full story. Dennis Leemans is a young and driven entrepreneur. He runs the DIVA-shop in the Antwerp diamond museum DIVA and also owns a flagshipstore of Silvius Druon: an exclusive jewelry brand, founded by his father. He talks about how his business combines quality, passion and Antwerpian craftsmanship, just like Conid. Next to our regular collection, the public could also discover our newest addition to the collection: the Cavens Pen. 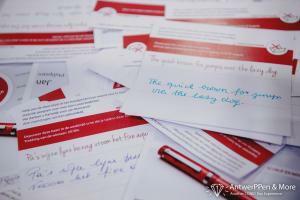 As we wanted to celebrate the unicity of handwriting, we wanted to capture a little snippet of everyone’s unique sense of writing. This resulted in a beautiful set of unique pangrams: a very special memory to this very special night. 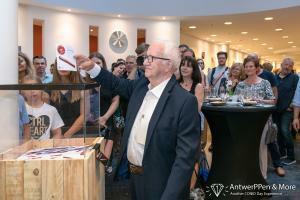 Please find this amazing blogpost of The Pencilcase who was also present at our AntwerPPen & More.We also like to share our first newspaper, a ‘special edition’ on the occasion of our AntwerPPen & More.